Medal Earned + Record Smashed! I know I sound like a broken record, but it is SO hard to believe that we arrived in California a week ago! But enough about me…let’s talk about the race! The start time of the race was a very reasonable 6 AM…however, the cut-off time for dropping your bags was 5 AM – despite this early hour however, it was an amazingly stress-free experience getting out to the staging area! 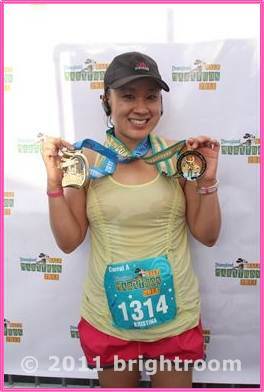 You see, unlike the Walt Disney World race, it is totally walkable from many resorts – both on and off property! This basically means that at Disneyland, you get to sleep in an hour! Another bonus? The temperature was around 60ish that morning – which meant surrendering my Mickey Mouse hoodie a little before 5 AM wasn’t painful in the least. Our California trip involved two hotels: Disney’s Grand Californian and the Anaheim Desert Inn. Ideally, we would have spent the whole trip at DGC, but alas, it was all booked up – next time I will remember to call THE DAY that I can book with DVC 😉 Anywho. 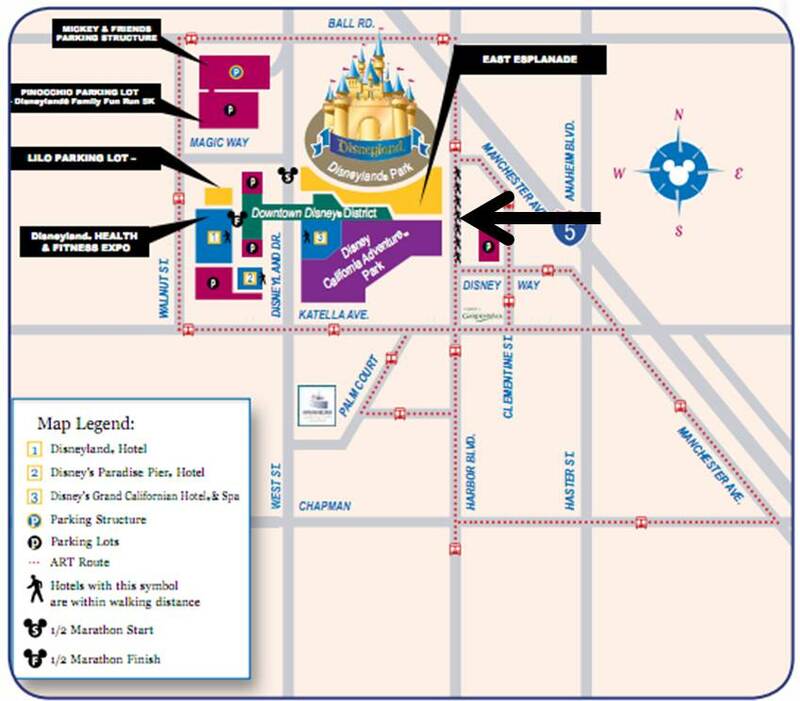 ADI was but a jaunt across the street from Disneyland property so it took me all of ten minutes to reach the race staging area, instead of the 2-3 minutes it would have taken to get there from DGC! Fortunately for me, as I walked over, I heard some familiar voices! 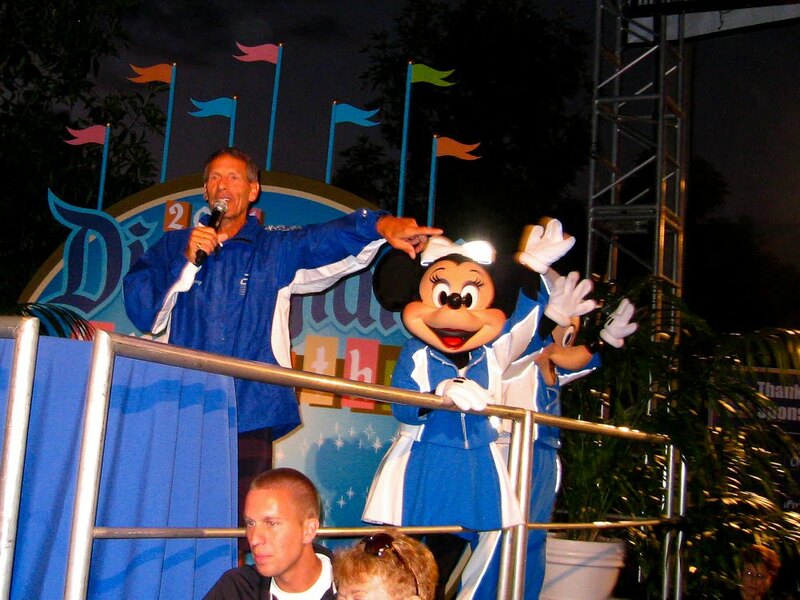 Some good friends from my WDW days, in fact! Jeanne, Ryan and Kim! Hanging out before the race! As the DJ warmed up the crowd with some high-energy tunes, we chatted a bit about our race goals – we were all Coast to Coast challengers, after all! 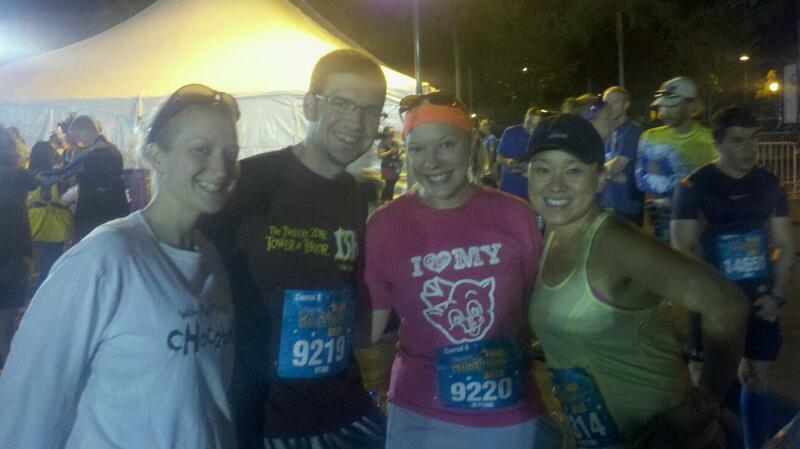 Jeanne and Ryan said that 3 hours would be a good goal, and Kim said she was there to have fun and finish! All good goals, IMO! I also chatted with some of the runners around me and learned about some pretty cool races from them (especially The California International Marathon in Sacramento.) Two of the runners I chatted with were running their very first Disney race but were actually training to qualify for Boston! Their goals for this race? 1:30 – 1:40! Dang!! After wishing each other luck, it was about time to go! I was actually quite a big fan of this course! 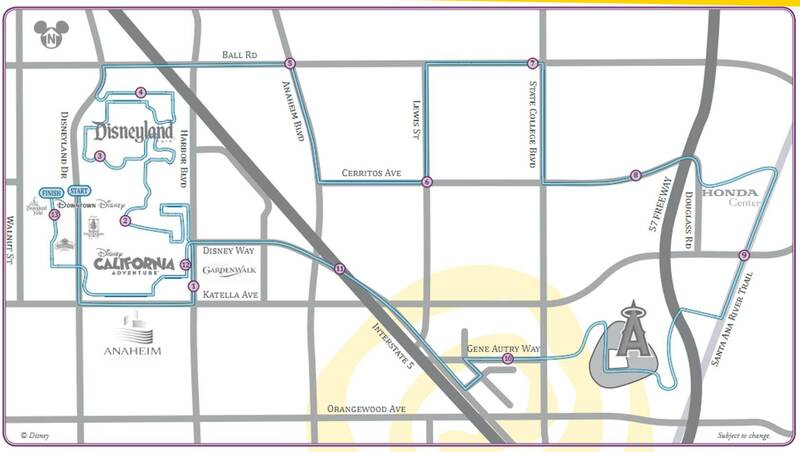 See, it started around the Downtown Disney area, then looped down Katella, up Harbor a spell, past Disney’s California Adventure and then, Disneyland! Amazing…see, by the time you loop out of the park, you’ve already put down four miles! Once we were on the streets of Anaheim, I switched my Walkman on (I raced with this) and just let the miles roll. I kept checking my watch when it chirped mile markers and though they were not synced with the official ones, it was nice to have the information available to keep track. …and we were headed into the parking area of the Honda Center! From there, the course hit back onto the Santa Ana River Trail – packed dirt, which felt great on the knees and was just what I needed for a bit of a power boost! 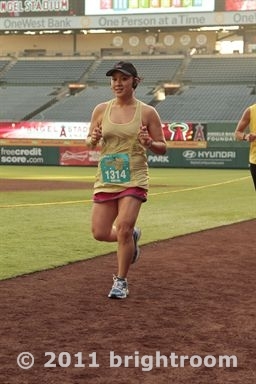 By the time we ducked into the Angels Stadium, were were on the Mile 10 approach! I would totally be lying if I said that I wasn’t tired at this point…but I kept telling myself…all you’ve got is a 5K left! You can do this! 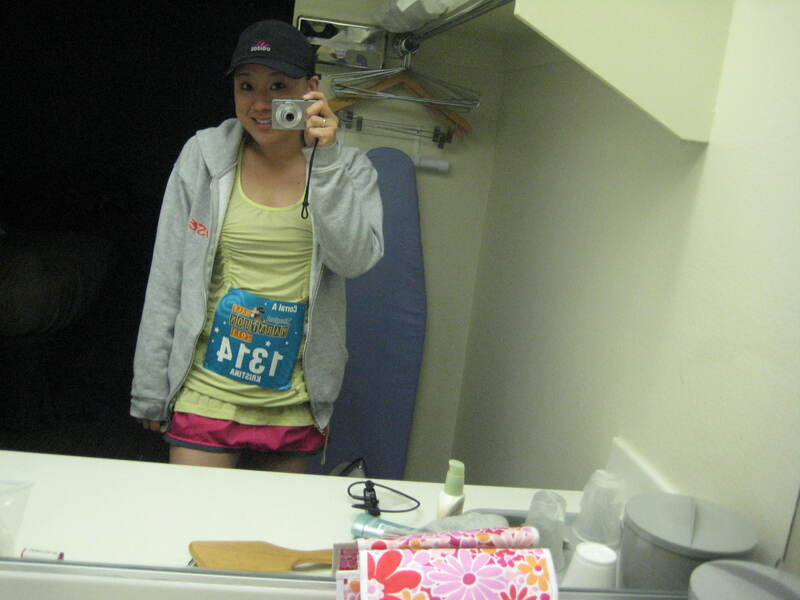 I looked down at my RoadID’s quote – “Keep Moving Forward.” I waved at every single spectator. I gave tons of high fives…it felt like a video game! Each one was like a 1 UP! Yes! 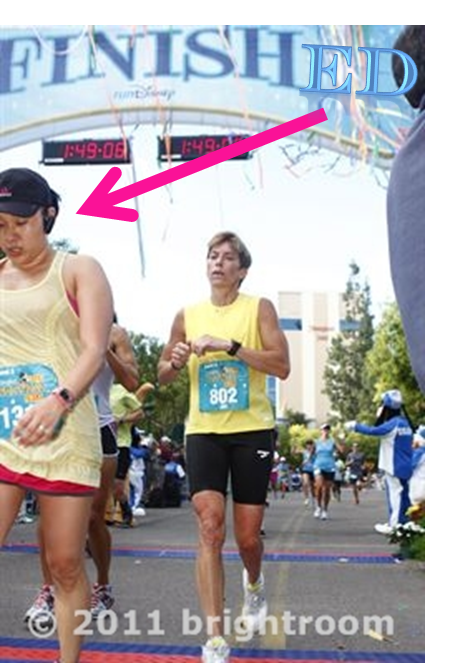 I could see the banner…I could see the timers…I was going to finish in LESS THAN 1:50! Boom Shaka Laka! Hahahahah! Delirious happiness, that’s for sure! After walking down the shoot, I picked up both medals, picked up a mini bottle of Blue Powerade and a mini chocolate brownie Clif Bar – chowed on that instantly snapped an official finish pic! Covered in salt, but I don't care! I walked along out and around the finishing area, then headed out to hubs + my meeting spot…JAMBA, of course! 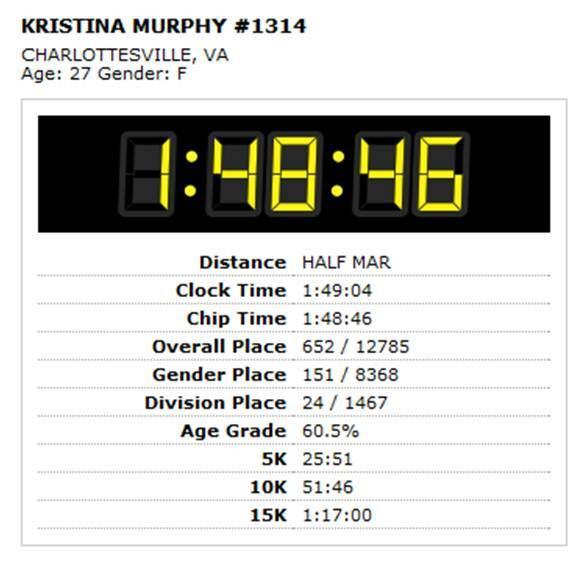 I had a 16 oz smoothie, congratulated fellow runners, checked on my watch + splits (somehow I did run negative splits!) and then we headed back to the hotel so I could shower and get into some dry clothes. Yowza! All in all, it was an AMAZING experience and I am so glad I got to take part in it! 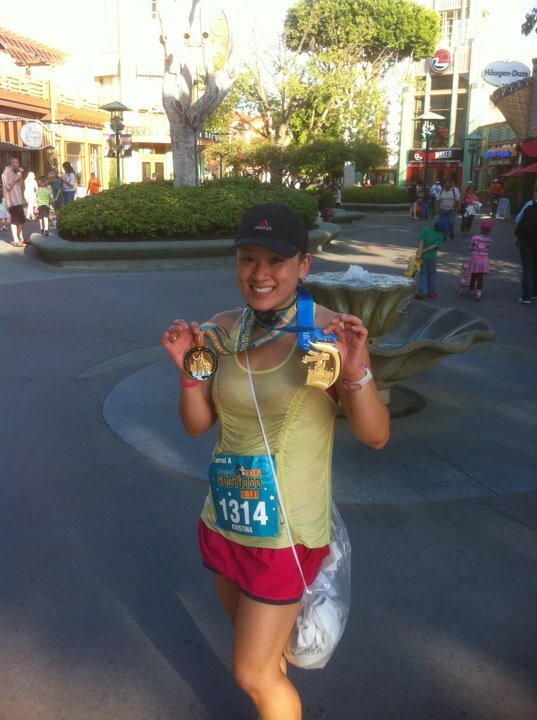 I would do another race at Disneyland in a heartbeat, and would recommend this one to runners of all ages and experience – from the elite to walkers alike. Do you have any questions about this race or my experience? I would love to answer any questions! What a great post!! Congrats friend! we most def need to run one together next year! 🙂 woot woot and I agree with you Disney really does know how to throw a good race!!! 🙂 love the BLING!!! keep up the good pace runner!!! Congratulations on finishing/coast-to-coast/incredible time!!! It’s posts like these that motivate me! Aww, thanks Michelle! 😀 It was such a fun experience!! 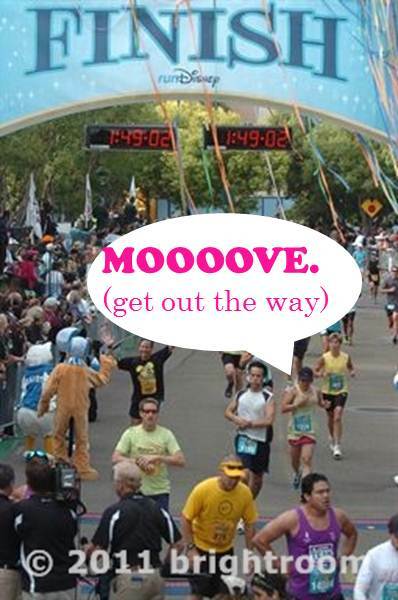 Loved this recap…hilarious.You smashed that half marathon into pieces. Can’t wait to hear about your marathon (soon!!). Thanks, Allie!! I am so stoked about the full now… you still thinking about training for a half? Wow your stats are crazy! Way to go Woman!! Thanks, lady!! Had so much fun! My thoughts, in order of appearance. Cute skirt! Oh a half marathon, cool! Wait, does that really say 1:48? Srsly? Holy smokes! Wow, Krissy has amazing legs. Mooove, lol. Boom Shaka Laka lol again. Thanks so much!! I have to say, the craziest thoughts pop in your head after running many miles! !